Fri, Nov 9, 2018, 08:04 pm SL Time, ColomboPage News Desk, Sri Lanka. 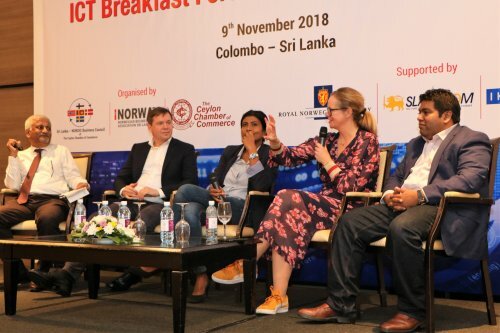 Nov 09, Colombo: The Sri Lanka - NORDIC Business Council along with the Norwegian Business Association Sri Lanka, and the Ceylon Chamber of Commerce held an ICT breakfast forum and networking event at Cinnamon Grand on 9th November. The Royal Norwegian Embassy supported the event in cooperation with SLASSCOM and ICT Norway. The Chief Guest at the event was H.E. Thorbjørn Gaustadsæther, Ambassador of Norway to Sri Lanka and Maldives. The event was held with the aim to facilitate possible collaborations between an ICT delegation from Norway and ICT companies in Sri Lanka. There was also a panel discussion on the theme "21 Century Skills - How do we create a talent pool for the future". 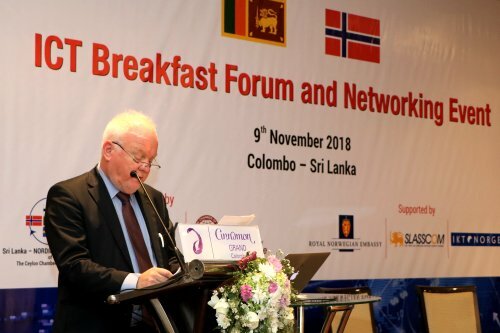 Addressing the gathering Ambassador Gaustadsæther said, there will be a considerable shift in skills and talent required from the global workforce in the next decades. "Jobs of the future will require more critical thinking, advanced skills in STEM (Science, Technology, Engineering and Maths), creativity, interdisciplinary knowledge and people skills among others. Building this talent pool for the future has to start now, and it is the responsibility of government, policy makers, as well as the private sector and individuals." The Norwegian ambassador said since the need is so critical, the IT industry must take the lead. "If you wait for the government, this will take too long and might not be what you require. Therefore, the IT industry must come together, although competitors with each other, in this question you have only one goal: that is creating the right pool of talent for the industry needs," he emphasized. Speaking during the panel discussion, Jeevan Gnanam, Chairman SLASSCOM said that this year alone the IT industry needs about 16,000 individuals to join the industry, and that the current university system does not meet the needs of the industry. Lars Mortensen Lægreid, Founder of Emergence School of Leadership in Norway said that it is good governance, which makes Nordic countries prosperous. He also spoke of the importance of sustainability for all industries and the ability of technology to provide new solutions to problems. One of the key areas in which skills are rapidly changing is the ICT industry. With more than 300 companies, the local ICT sector serves a broad range of industries ranging from communication, apparel and textiles, banking financial services & insurance (BFSI), healthcare, manufacturing, media, retailing, transportation to travel and leisure among others. The discussion on the skills requirement was topical in the ever-changing ICT landscape.